Home ♦ Coffee ♦ How is flavored coffee made? French vanilla, hazelnut and other types of flavored coffee usually to consumers looking for something a little sweeter and a little milder than other types of beans. 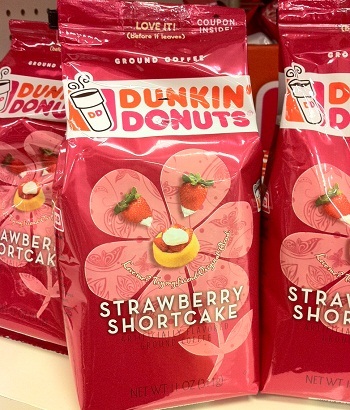 Flavored coffees don’t allow you to taste all the complexity of black coffee, but at the same time, they usually deliver more of an aroma of their “flavor” rather than a strong dose of hazelnut or, in the case of the Dunkin’ Donuts coffee pictured above, strawberry shortcake. This begs the question: how is flavored coffee made? Flavored coffee can be made in a variety of ways. The simplest way to flavor coffee will add spices alongside the beans, and the spices are soaked into the water along with the coffee as it brews. Most flavored coffees, however, are flavored by mixing flavoring – either a natural or artificial flavoring, usually mixed with water or some other liquid – into freshly roasted coffee beans. The flavoring gently coats the beans and is essentially steeped into the brewed coffee. Often, flavored coffee is ground before flavoring is added to increase the surface area that the flavoring can cover. Powdered flavorings can also be added, although that generally works best with already ground coffee. Coffee aficionados will tell you than many manufacturers use less expensive beans (or simply a whole variety of beans mixed together rather than a specifically formulated blend) to make flavored coffee because the flavors will cover up any imbalances in the beans. This may be true in some cases – though there are plenty of companies that use high quality beans for all of their products – but it is definitely true that you will not be able to taste the nuances of a perfectly roasted coffee bean after flavoring has been added, so it isn’t worth putting your very best or most expensive beans in a batch that is going to be flavored. So, with the exception of the occasional batch of spiced coffee, the flavoring comes from natural or artificial flavoring liquids that are added to the coffee beans. Actual ingredients like hazelnuts and chocolate are not added to coffee to produced flavored coffee and this is why flavored coffee usually has a stronger aroma of the “flavor” rather than the distinct taste of it.